John Kerry is returning to the Middle East to present his peace plan. Two recent articles show the way the peace process is misrepresented in the media. The AP reports Israel, Palestinians Face Hard Choices. Israeli Prime Minister Benjamin Netanyahu would likely have to recognize Israel's pre-1967 war frontier as the starting point for border talks with the Palestinians, an ideological reversal that would put him on a collision course with his hardline base. Palestinian President Mahmoud Abbas fears he'll be pressured to recognize Israel as the homeland of the Jewish people, a step he believes would abrogate the rights of Palestinian refugees and their descendants. The parallelism here is bogus. In the first place the idea that having the "pre-1967 war frontier" (more correctly they should be called "the 1949 armistice lines") as a basis for any peace deal is a departure from the original intent of Resolution 242. After the 1967, Six Day War, there was an international consensus that an Israeli return to its pre-war borders was a "prescription for renewed hostilities." While Prime Minister Netanyahu's explicit acceptance of a two state solution was considered an integral part of the peace process; a parallel acceptance by Palestinian Mahmoud Abbas is considered a dilemma. The fact is that one of the reasons that there's still no peace is because the Palestinians reject the historical connection between the Jews and the state of Israel. Furthermore, since one of Abbas's demands of a peace process (and one that has been accepted by the world) is that Jews are not allowed in Palestine for him to worry about the "rights" of Palestinian refugees is a bit hypocritical. That's the point of a Palestinian state. The choices presented associate a rejection of an international consensus for Israel as "hardline," and a rejection by Abbas of fundamental aspects of peaceful relations as standing up for "rights." Netanyahu has so far refused to accept the 1967 lines as a reference. Doing so would imply Israeli willingness to partition Jerusalem and its sensitive religious sites, give up most of the West Bank and uproot tens of thousands of close to 600,000 Israeli settlers living on occupied land. Such ideas are anathema to Israel's right-wing, including many in Netanyahu's Likud Party. Israel withdrew from Gaza in 2005, following a dramatic decision by Israel's most famous hawk, then-Prime Minister Ariel Sharon. There are two things missing here. Abbas has already rejected a proposal very similar. In fact Saeb Erakat, the chief Palestinian negotiator, said that any division of Jerusalem was unacceptable to Abbas. Abbas has already rejected a proposal very similar. In fact Saeb Erakat While the Israeli withdrawal from Gaza is sometimes presented as a hard choice Israel made for peace; its results are then ignored. In fact Hamas now has control of Gaza and has an effective veto over any peace deal. Yet it is Netanyahu who is said to be "right wing" or giving in to "hardline" opinion and Abbas is the one who's status is not critiqued in any way. A New York Times article, Israel's Pairing Prisoner Release and Settlements Angers Many, similarly presents a major choice that Netanyahu made in ideological terms. For one thing, it wasn't Israel that paired prisoner releases and settlements; it was Secretary of State John Kerry. Rather the article is reported in a fashion to show that Netanyahu has angered Israelis across the political spectrum. Netanyahu chose the prisoner releases because he assumed that releasing prisoners (originally intended to be a "confidence building measure" and only applying to non-violent prisoners) would be required in any final deal but that settlement freezes would weaken Israel claims to the lands affected in the final status. 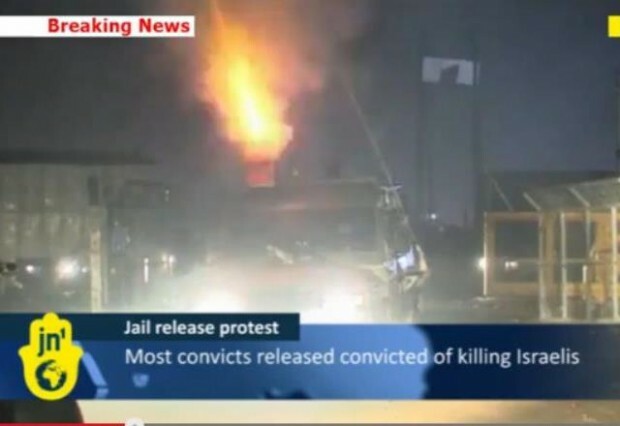 While the Israeli distaste for the prisoner releases is reported; there is no reporting of the Israeli revulsion at the Palestinian celebration of these monsters. One of the critics that the New York Times quotes is David Weinberg. "The thing that bothers me most is the connection that's been created between prisoner release and settlement construction," said David M. Weinberg of the Begin-Sadat Center for Strategic Studies at Bar-Ilan University. "It's tainted with the whiff of being some sort of perfume meant to cover up the stink of the terrorist release, so that undermines whatever sense of real positive Zionist direction those on the right would theoretically feel from building in the territories." It isn't clear that Weinberg is necessarily criticizing Netanyahu. From the statement printed, he could have just as easily been criticizing Kerry for offering Netanyahu the choice. However it is presented in a series of criticisms of Netanyahu. But Weinberg has written more about prisoner releases. Furthermore, it makes sense to invest in quality-of-life infrastructures in the PA like industry, modern housing, the justice system, and water and waste facilities  all of which are necessary if a long-term architecture of peaceful coexistence is to emerge. But why look the other way when Abbas signs checks to terrorists, feeding the narrative that murdering and maiming Israelis is a heroic enterprise? Shouldn't this be a central topic for discussion in the current Israeli-Palestinian peace talks? Shouldn't abjuring terror, refraining from glorifying terror, and stopping to pay for terror, be a central Israeli and international demand of the Palestinians? The reporters for the Times were so intent on portraying Netanyahu as out of touch that they ignored the real elephant in the room  the Palestinian celebration of the murderers. While the Times reported on the celebrations, it didn't express any judgment of those celebration; it didn't quote Israelis who were offended by the honoring of unrepentant murderers. The Times went even further. "I can't describe my feelings," said Nawaman Al-Shalabi, who was convicted in the killing of three Arabs suspected of collaboration with Israel. "Twenty-two years, now I know what's the meaning of freedom." Last year the New York Times featured a picture of the mother of a terrorist who just killed an Israeli soldier rather than one of the soldier. It would appear that the New York Times is still in the business of glorifying terrorists. It's nice to know that a man who killed three people now gets to enjoy freedom his victims never will. There's no reason to amplify his joy, unless it's to show the perversity of the Palestinian reverence for murderers, which the Times makes no effort to illustrate. The common theme in both articles is that Israel is led by an ideologue incapable of making the necessary sacrifices for peace and that Palestinian demands are perfectly reasonable no matter how much they contradict the fundamental requirements of peaceful coexistence. The bias displayed by these articles appear to be consistent with the views of Secretary of State Kerry. Defense Minister Moshe Ya'alon argued that those who believe that there can be peace without a change in the Palestinian political culture are fooling themselves. Ya'alon revealed why he had rejected the proposals, and in doing so, signaled a major impasse in the diplomatic process with the Palestinian Authority and US efforts to lead to a breakthrough. "When I'm told about the security answer in Judea and Samaria, and when they talk about satellites, drones and technologies, I say, 'guys, you're wrong.' The principal problem is education. If in Nablus and Jenin they continue to educate the young generation as it is being educated today, to idolize terrorism and jihad, and that the Jewish people have no right to this land, if this is how they're educated, than technology stops nothing," he said. "If the education does not change, we'll have the same pressure from the inside. And then there will be a Hamastan in Judea and Samaria, like in Gaza. It'll hurt us, it'll hurt Jordan and it'll hurt other interests in the area." Those like Kerry, the AP or the New York Times who see peace around the corner if only Israel would be reasonable take great pains to ignore the other side of the equation. Ya'alon's response is an important reminder about the limits of peacemaking; especially when only one side is making the concessions.